El Greco (‘The Greek’) was a 17th century Cretan painter who was deeply religious and prayed intensely. El Greco settled in Toledo, Spain, where he firmly immersed himself within the Spanish Renaissance tradition. His deeply religious beliefs and tendency towards mysticism impart his paintings with shadowy conviction. 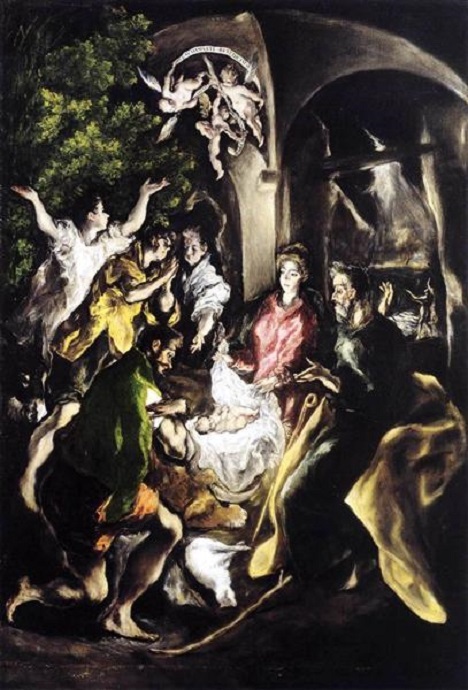 ‘The Adoration of the Shepherds’ depicts the ecstatic reception of the birth of Christ. Angels hover and shepherds kneel, while light and darkness compose a sense of awe. This painting was intended to hang over El Greco’s tomb – as the angels watched over Jesus in birth, Jesus would watch over El Greco in death.